If you love movies that transport you to alternate universes, or into pasts which never quite existed but might have, or into the future, or into situations that just plain scare the tar out of you, then there is no question -- you need to know about The Academy of Science Fiction, Fantasy and Horror Films, and the award it annually bestows upon those deemed the best at doing all that, and more: The Saturn. I, like so many others, am utterly captivated by actors. Maybe not for the most obvious of reasons, though. Certainly there's that 'larger than life' aura, but for me, it's more about the fact that what they create -- their 'art' - is so very public. I am an author, and while the end result of my creative juices (the books and stories I write), is eventually in the hands of the population at large, my actual creative process, the writing itself, is always done in private. Indeed, some authors even go so far as to physically remove themselves from the eyes and ears of those around them by locking doors, disconnecting telephones, building a shed out in their backyard, or traveling to a place far away from anyone who might interrupt them. By the time the rest of the world has their hands on the fruits of an author's labor, we are elsewhere, most likely working on our next project. But what actors do, of necessity, they do in public, for all the world to see and judge, then and there, on a stage or in front of a camera, with countless people all around, watching, analyzing, praising or criticizing, applauding or groaning, while the actor is in the process of practicing his or her craft. In that moment, they are the art. Subjecting oneself to that takes a very special kind of moxie. Actors don't get to backspace and edit as writers do! Of course, actors are by no means the only film and TV professionals honored by the Academy -- the foregoing was simply an observation of my own. 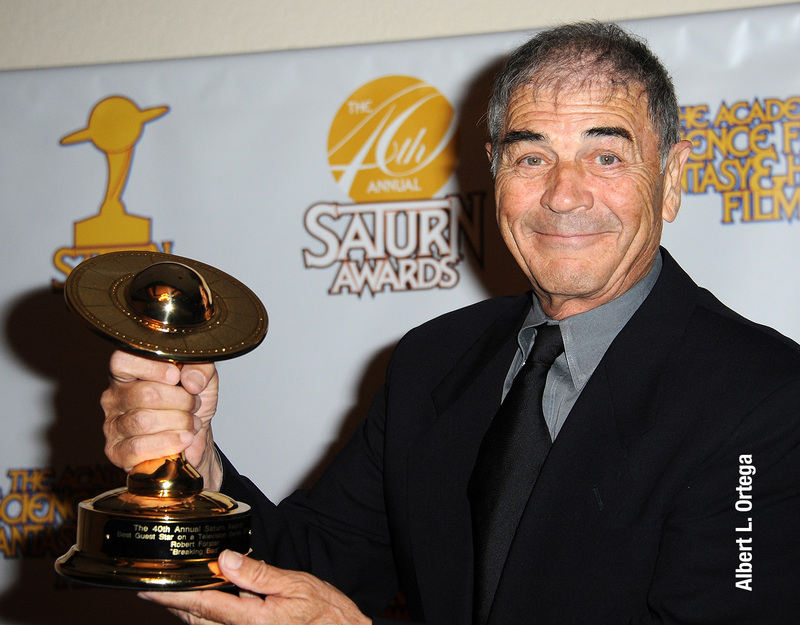 And, in keeping with that, one of the first actors I had the pleasure of meeting at the 40th Anniversary Saturn Awards Show, which took place at the lovely Castaway Restaurant in Burbank, California, on June 26th, was the esteemed Robert Forster, who later that evening brought home a Saturn for "Best Guest Star in a Television Series", the series being "Breaking Bad." We met before the ceremony began, while everyone was enjoying a few cocktails as we waited to enter the banquet hall. We were standing in a small group and he extended his hand, smiled, and said, simply, "I'm Bob." Of course, I knew who he was and which award he was up for, but I had a sudden memory of having seen him recently in something else ... and naturally, I couldn't remember what! Robert Forster proudly displays his Saturn for "Breaking Bad"
During dinner, that nagging, almost-memory would not leave me alone. Forster was seated at the next table, and finally, when I couldn't stand it anymore, I went over to him. "I'm sorry, Bob, " I said, " but it's making me crazy. I know I've seen you in something very recently, but I can't, for the life of me, remember what!" He laughed and said, "Well ... I don't know how I can tell you which movies you've seen lately." But he was a good sport about it. 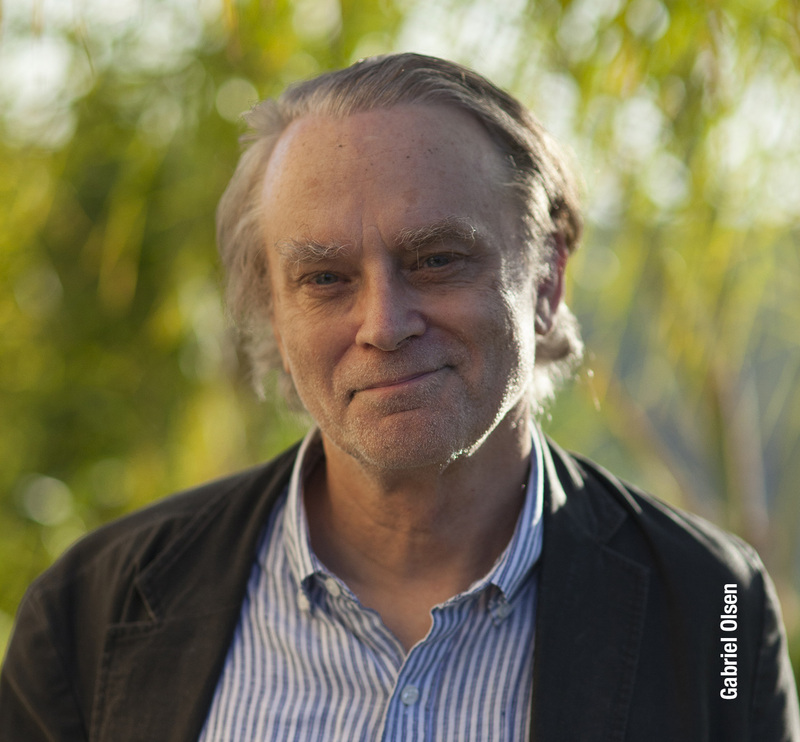 He named his last few films and when he got to "The Descendents" (with George Clooney), I said, "Yes! Yes! That's it! Thank you! Now I won't be up all night trying to figure it out," to which he replied, "Glad I could help!" 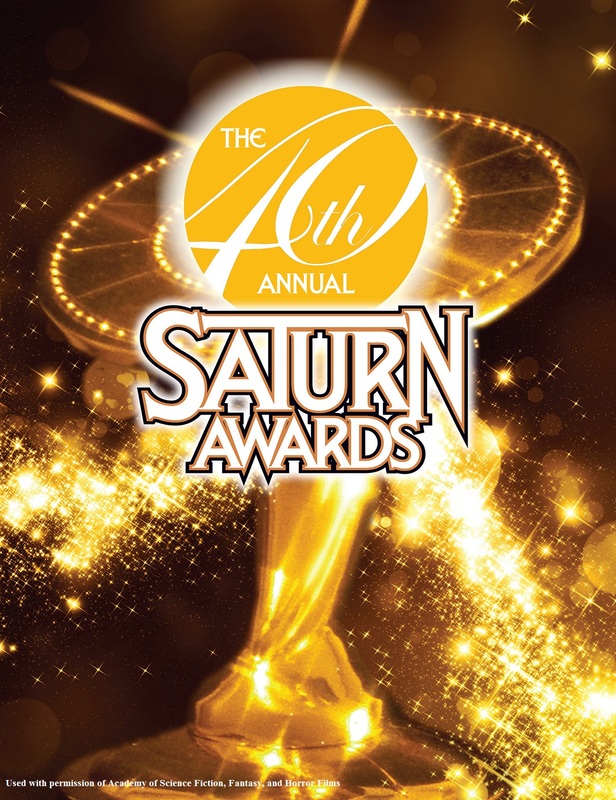 Later that evening, when actresses Erin Gray and Lindsay Wagner presented him with his Saturn, he looked at the statuette in his hand, smiled, and said, "It's good to be overrated!" Then, in all seriousness, he told us, "This award is the perfect example of 'the writers do the work, the actors get the credit'." An utterly charming man: gracious and -- thank goodness -- patient. 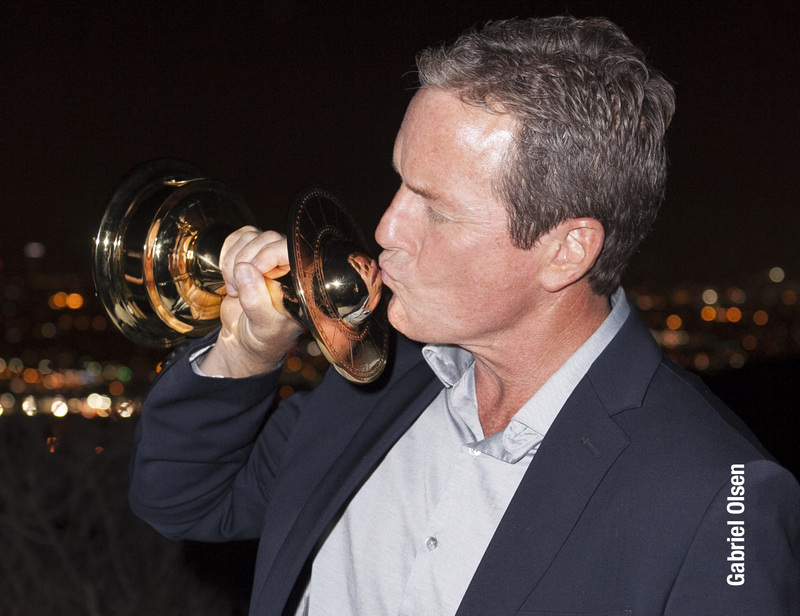 That perspective, by the way, that universal and unabashed praise for the writers, must have been shared by all in attendance, because when actor Linden Ashby ("Teen Wolf", "Iron Man 3", and "Mortal Kombat"), who, along with actress Holland Roden, accepted the Saturn for the television series "Teen Wolf" ("Best Youth Oriented TV Series"), he received a resounding round of applause for the following comments: "It all begins and ends with the written word," he said. "You can take a good script and mess it up, but you can't take a crappy script and do anything with it." I looked around the room and mostly what I observed was heads nodding their concurrence. Another person I met, and actually spent a good amount of time with, was fellow writer Shane Black ("The Long Kiss Goodnight", "Lethal Weapon" 1 thru 4, and, of course, "Iron Man 3", which took the Saturn in the category of "Best Comic-to-Film Motion Picture"). 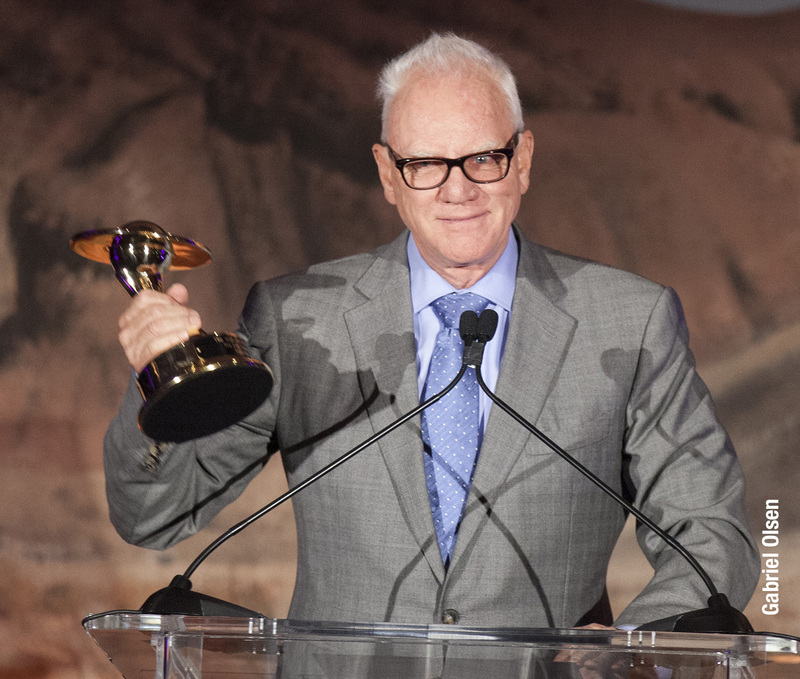 We spoke at length about his history, the Academy, and his personal feelings about it all. 1978 was the first time he watched the Saturn Awards ... with William Shatner. "Back then," he said, "it was so foreign to me. I never thought I'd be on the same stage ... and I'm still awed. I'm a fan of the awards," he told me, with all the passion of a gifted writer, "and you can quote me on that." One of the things I admire most about The Academy of Science Fiction, Fantasy and Horror Films is that they go out of their way to honor indies (independent films which, according to Academy director Robert Holguin, comprise about 40% of Saturn nominees) as well as international films, providing opportunities for talented men and women from all over the world, whether they have studio backing or not. If you recall from the last article I wrote on this subject, Bob Holguin is particularly proud of that, and well he should be - the Academy recognizes and embraces talent no matter what its origins, and that benefits us all. Aharon Keshales and Navot Papushado of Israel wrote, edited, and directed the "Best International Film", "Big Bad Wolves". It is, in fact, Israel's second horror film, and their second horror film, as well. The team is also responsible for Israel's very first horror film, Kalevet, which was, by the way, their first film, too. How wonderful for them, so early in their careers, to have their work and artistic abilities recognized in such a splendid fashion. Of course, no evening devoted to a celebration of science fiction would be complete without mentioning "Star Trek". And mention it they did - multiple times and for a variety of reasons. Actor John Savage, who will reprise his "Star Trek: Voyager" role, Captain Rudy Ransom, in the upcoming "Star Trek Equinox: The Night of Time" in 2015, presented the Saturn to executive producer Roger Lay Jr. for "Star Trek: The Next Generation", Seasons 3, 4, and 5 in the category of "Best DVD/BD Television Release". Mr. Lay, in turn, reminded us that, "Gene Roddenberry created the show 50 years ago, and it's still inspiring people." Taking that one step further, no discussion of "Star Trek" would be complete without the one and only, the very lovely - and incredibly amusing - Malcolm McDowell, who is probably best known amongst sci-fi aficionados for having killed our legendary hero, Captain James T. Kirk, in "Star Trek: Generations". Mr. McDowell, who's been in too many films to count, was presented with the Academy's "Life Career Award" and, from the moment he stepped onto the stage, explaining that when his manager, Chris, had called him to tell him he'd won, he'd "done the typical English thing and asked, 'Did someone else drop out?' " he had all 600 of us in stitches. Privately, Mr. McDowell told me he loved Robert Altman (who directed him in "The Company"), considered the man to have been one of his dearest friends, and believed him to have been one of the greatest directors who ever lived and breathed. McDowell also said he adored the film, "Gravity". Publicly, he shared a riotously hilarious account of his experience as Alex in "A Clockwork Orange", and how actress Madge Ryan, who played Dr. Branom, had to give him an injection in his derrière. Apparently director Stanley Kubrick decided it would be more realistic if Ms. Ryan truly did puncture his posterior with a real needle, and was not too terribly concerned with just how far into his nether-regions the needle was actually jammed, or how much pain McDowell was in as a result! The man had us rolling in the aisles. At the after party, in a private conversation with actor Brad Dourif, whom many of you will know as the voice of the extraordinarily terrifying "Chucky", and whom I personally adored as Grima Wormtongue ("Lord of the Rings") and Dr. Iggy Drexel ("Law & Order: SVU"), he echoed those same sentiments: in addition to a deep and genuine respect for the Academy's vision and mission, for its founder and its continuing management, and a love for the work he does, when Dourif spoke specifically about "Chucky", a role he's played over the course of 25 years, he said, "I certainly have a whole hell of a lot of fun!" And actually, that was pretty much the common theme of the evening: fun. It was a wonderfully relaxed atmosphere and those I spoke with, and those who addressed us on stage, spoke time and again of the camaraderie, the integrity, the refreshing absence of hidden interests. 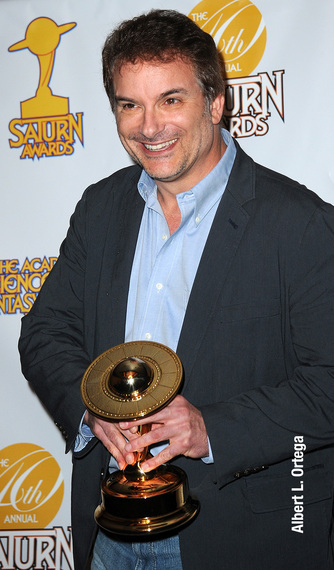 As "Breaking Bad's" executive producer, Mark Johnson, put it, "Thank you, Saturns, for being the most unironic, heartfelt, non-bull***t awards anywhere." Certainly there was the competition, but the overall feel of the event did not reflect that. Mostly, people spoke of a deep and abiding respect for the Academy and its directors, of their love for the genres of science fiction, fantasy, and horror, and their gratitude for an organization dedicated to recognizing the talent, creativity, professionalism, passion, and sheer enjoyment that goes into the making of these films and TV shows. I think Greg Nicotero, who was honored that evening with the "George Pal Memorial Award", the award given to "an individual who contributes to the high quality of filmmaking and helps elevate the genre films and television to new heights", described it best when he said, "I love that after 25 years of doing this, I still feel the way I felt the first time I walked onto a set."